It's been even longer since the days at the old shop where he studied his bloodborne pathogens training and proper procedures. He has put in a lot of work and learned quite a bit. He will continue to learn for the rest of his life and we can't wait to see what he accomplishes. Good Job Doug, keep up the good work! 8-06-16 Jesse Reasoner is no longer piercing with us. He has decided to pursue his martial arts training more intensely. We wish him the best with his endeavors. 11-3-15 Updated portfolios, made a few minor changes and added an explanation of the process for cover ups. 8-28-15 As many of you probably already know Jason "Chief" Betzing has retired. He did this due to a back injury and is unable to sit for long periods of time anymore. Any unfinished work can be directed to Ray. We are sorry for any inconvenience this may have caused anyone. We wish him the best and hope that his art career can carry on in some other way. 4-12-15 Did I mention that I'm terrible at sharing? We're working like mad as usual. Updated the site and fixed a couple of broken/outdated links. Eric has been coaching and bowling (he just turned 40, don't mention it though..just keep it between us.). Chief has been going to art school. Doug has resumed his karate training and still chugging away at his apprenticeship. My son Jesse has been learning to pierce and is coming along well. So that's a skim over what's been going on in the background of everything else. Thanks to everyone out there for all of the work and support over the past years. Keep it coming and we'll keep trying to make you happy with some new ink. 11-13-14 We're doing the annual Toys for Tats deal again. Bring in a $10 toy with receipt and receive $20 off any tattoo over $60 dollars or $10 off a piercing. We will honor this on appointments toward deposit as well. This lasts now until Dec 15th and is done in coordination with the Marine Corp Toys for Tots program. 10-28-14 I am so terrible at this news thing. Two days til the blood flows. 5-31-14 We are currently looking for qualified tattoo artists. Neither Ryan Suarez nor Chris Bussing are working with us anymore. Any follow up on tattoos done by them may be directed to Ray. 4-17-14 May 2nd-4th we'll be at the DeltaPlex in Grand Rapids for the Skin Deep Tattoo Expo. Come check it out, should be a good time. 12-11-13 Just a few more days left in our Toys for Tats Program. Help us to help some kids out for the holidays. 10/15/13 We've been able to find a blood donation company that is actually willing to deal with the fact that many of us are tattooed. 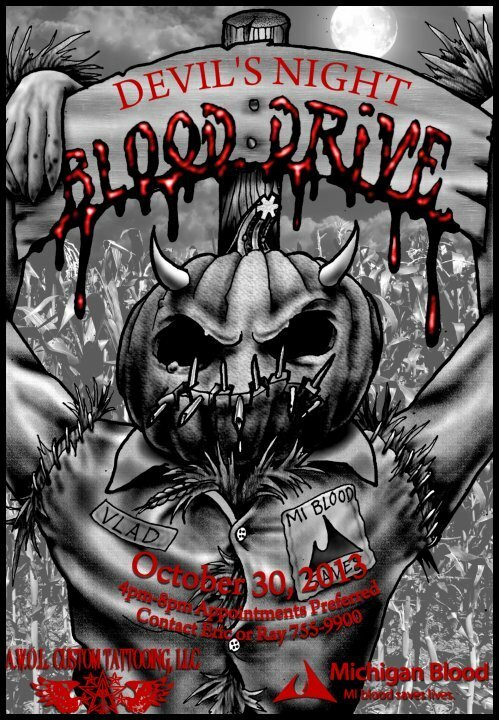 Michigan Blood will be joining us here at the shop on the 30th for a blood drive, appointments are preferred. 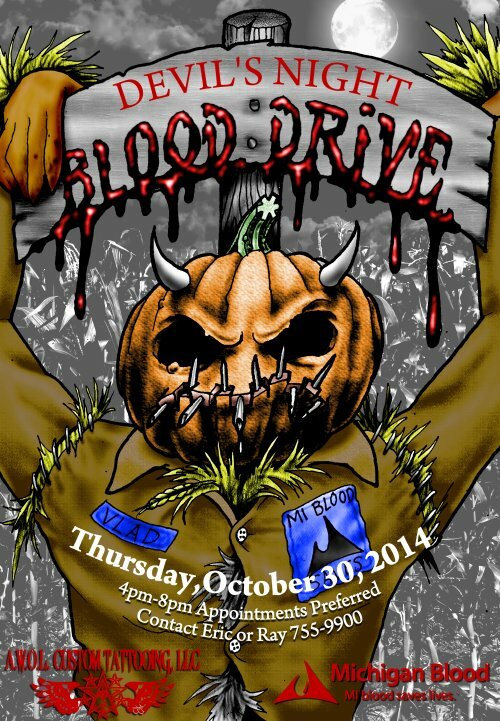 4pm-8pm call 755-9900 and ask for Eric or Ray to schedule a time to help out those that need it so much. 5/21/13 So...we've been pretty busy and the site rebuild took longer than expected. Ray just totally revamped everything, check it out. Josh Schultz is unfortunately no longer working with us and he returned back to the comfort of his old home. 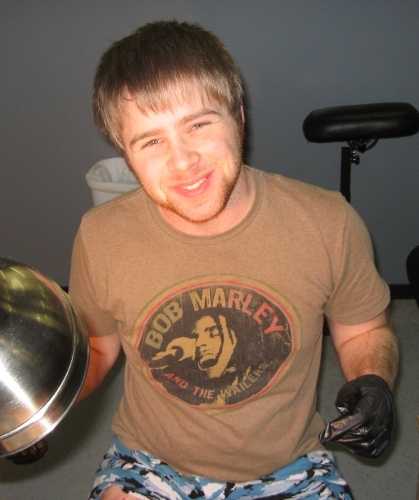 We do however have a new addition to our site, though he's been with our family for a while now, piercer and tattoo artist Chris Bussing. You can check out his bio here and his work here. 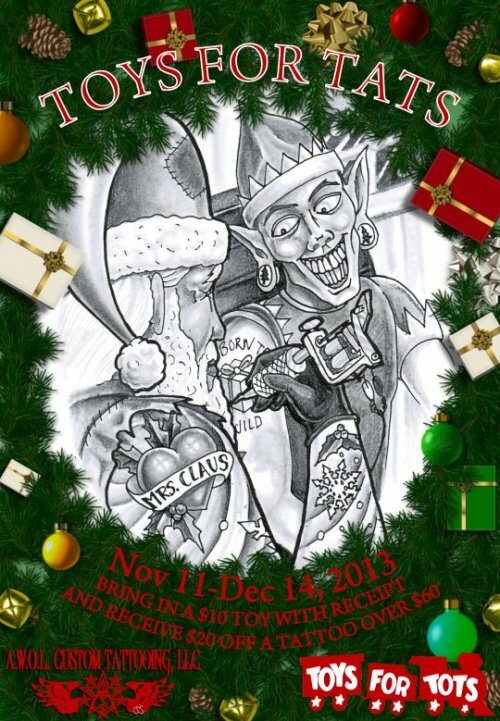 11/23/12 We're announcing our second annual "Toys for Tats" program that will be running from now until Dec 10. Bring in a unwrapped toy in the package with receipt of ten dollars or more and recieve either $20.00 off a tattoo of at least $60.00 , $40.00 off a tattoo of $200.00 or more, or get any piercing for $25.00. Only one discount per tattoo or piercing. This is done in coordination with the Marine Corps "Toys for Tots" program. We are also a drop location for the program. 10/24/12 Site updated......yep that's all. Site updated. 10/20/12 We've got tickets to next weekends Halloween party at Harpo's. The party will be featuring Mushroomhead, JMann, and Minus 2. They are a helluva bargain for 15 in advance from us and 22 at the door. Stop on in and get yours. 8/14/12 Updated a good chunk of the site including adding portfolios for both tattooists and apprentices to the artist page. We would like to welcome Muskegon tattooing veteran Josh Schultz to the family as well as some young blood from Ryan Suarez. We are currently selling JDRF shoes to support the Seabolt family's team for the JDRF walk. You can donate straight to them here if you can't make it up to the shop. We would also like to thank Kevin James Blackmer for coming in to the shop and taking some wonderful shots for us. 5/14/12 Just updated Jason Betzing's portfolio and his wishlist as well as some of Ray's. Quintin Smith is no longer working with us, anyone needing repairs to work done by him at our shop should contact Ray. We are currently interested in finding intelligent, reliable, non-alcoholic and/or dope addicted, non-rockstar, low ego, low drama tattooists that can pass a background check and above all, actually know what they are doing. We are beginning to realize that this is quite a feat, but we are willing to give it a chance. Contact Eric or Ray with all inquiries ONLY if you meet these requirements. Also, join us June 1st to celebrate our five year anniversary. 3/7/12 Just updated the FAQ section of the site along with the portfolios for Eric, Quintin, and Ray. 3/1/12 Announcing the A.W.O.L. Tattoo League program. If you like to bowl and like tattoos you can enter this program and receive a gift certificate for a tattoo from us at the end of it. It's Saturday nights at 7:00 pm starting March 24th at AMF Muskegon Lanes 1150 Whitehall Rd 49445 and goes for ten weeks. For $10 a week per person you will all get a $70.00 gift certificate, $15= $190.00 certificate, and $20=$250.00 certificate. So not only do you get a tattoo for less than what you are spending (in option 2 or 3), you also get three games a night with shoes included. It's a win, win situation, even if you lose the game. So all you need is 3 other people that can stand hanging out with you on Saturday nights for ten weeks to knock some balls around and an urge for ink. Enjoy! 12/20/11 We'd like to thank everyone that participated in our "Toys for Tats" program. For it being our first year it was a pretty big success. Our box was overflowing and there should be a bunch of happy kids because of your involvement. Thanx again. Updated pretty much all of the portfolios, one way to get to them is through our artist page. I've also added an article on staph for anyone having any health questions. 11/16/11 A little late on this one but we're announcing our "Toys for Tats" program that will be running from now until Dec 13. Bring in an unwrapped toy in the package with receipt of ten dollars or more and recieve either $20.00 off a tattoo of at least $60.00 , $40.00 off a tattoo of $200.00 or more, or get any piercing for $25.00. Only one discount per tattoo or piercing. This is done in coordination with the Marine Corps "Toys for Tots" program. We are also a drop location for the program. I also just updated Jason Betzing's portfolio. A ton of new stuff to gander at in there. 10/29/11 Updated the Tattoo Related Terms area. Added lots of stuff and a bunch of new links, etc. 10/8/11 Finally settling in and getting things organized, whew, great fun. Updated Ray's portfolio. We'll get some more updates soon. If you didn't happen to find it check out the tattoo myths section to help dispel some of those urban legends that float around about tattoos. 8/30/11 So after a nice long journey we are FINALLY IN THE NEW SHOP. We can't express how happy we are to be into our new home. Thank you to everyone that made this possible. Come on in and check it out. There are so many changes to the site that I'm not going to list them all, feel free to surf around, check it out, and we'll see you soon. 5/19/11 Updated Quite a few tattoo pics in Ray's portfolio as well as a few in Jason's. The carpet has almost hit the ground in the new shop, I can taste it, not the carpet but the...oh nevermind, hehehe. Later Days, Ray. 5/01/11 We've just added Jason Betzing's portfolio to the site. Jason is a Michigan native that has traveled the world, check him and his artwork out. The new shop's nearly done. We've been busy as hell working on everyone out there and on it. Thanx again to you all. We'll let you know when we have moved out of the Hackley address and into the Sherman location. 2/15/11 We kinda forgot to mention that the shop won an art contest for a local longboard company, Smokin' Mad Love, you check it out here. We kept it kind of bold so that it would be easier to print on the boards. The wood grain would be the board. Yes that is the explanation for it's simplicity, we do actually know how to shade, hehehe. 1/9/11 It's a little over a week into the new year and everything is going great! 2011 looks to be very promising. We've been inking and piercing away, and having a good time doing it. We are one step closer to moving since we passed our final electrical inspection last Friday. There's not much left to go as we move ahead. I updated some images and renovated the About Us page for the site. Hopefully I'll get to updating some portfolios later this week. If not, we'll catch you next month. Later Days, Ray. 12/23/10 And as we near the end of another wonderful year we at A.W.O.L. would like to thank everyone for their patronage. It's been a great year and we look forward to next year being even better. We'll be announcing a move date to our new building soon (cue "Good Times" theme) and possibly some new faces will be seen here as well. I love the future, it's so full of...whatevers, hehehe. Thanks again and Happy Holidays from the crew! 10/14/10 So there are a couple more wallpapers up and about three months of work is finally done you can check out our new alternate layouts for the site. There is a Halloween layout as well as a Gambler layout. More of these to come over time. Thank you for checking us out. 9/1/10 It's starting to get chilly out, it's the best time of year to get ink! No sun, sweat, or sand in your fresh tattoo! I've updated the site and added many pics to the artists portfolios. After you've looked at those you could also check out the section of our site that's dedicated to everything art and tattoo related. 8/3/10 So July was one helluva month and I didn't make it on to update the site. I updated the FAQ, and added some pics to the other portfolios as well. 6/13/10 We'd like to thank everyone for their business. Without all of you we couldn't do what we do. One way that we'd like to do that is by announcing our wishlist areas for each artist. The wishlists can be found in our artist area by each profile. Wishlists are images that our tattooists would really like to do and would be more willing to negotiate price on. As they are done new pics will be added and old ones will be crossed out. Here's Ray's wishlist, for example. Portfolios and FAQs have been updated as well as adding email addresses for Quintin and Travis. Oh yeah, I also updated Eric's portfolio and bio, as well as a few pics to Quintin, Travis, and Ray's portfolios. 3/28/10 Wow, two news updates in one month, yes I am going crazy waiting on the building permit (should be this coming week) and updated the site with a bunch of eye candy. Later Days, Ray. 3/15/10 Just updated Eric, Travis, Quintin, and Ray's portfolios. Slow and steady with the new shop, starting to make some headway with the hoops that we have been jumping through. We might even get a building permit soon, hehehe. All in good time. 1/28/10 Ray is going to be out of the shop until Monday. But here is a nice little ad that we just had done. 1/26/10 Liz Lundsford is officially no longer tattooing here. Any problems with any of her work can be directed to Ray and he will take care of them free of charge. Our sincere apologies to anyone that she performed an inferior tattoo upon. We were under the impression that she was doing quality work and since she has been gone on leave we have recieved a flood of serious touch-ups and reworks. We take this business seriously and if we had known sooner, she would have been gone sooner. Sorry again. 12/23/09 We passed our Muskegon County health inspection with flying colors. The plans for our new location are almost done! What's that, you didn't know that we were moving? Have no fear, we are only moving about half a mile into a bigger, better location. We are completely stoked about it! We'll keep you posted as this moves along. We've updated portfolios and finally added one for Travis. Happy Holidays to everyone. 12/03/09 Liz Lunsford is not currently tattooing with us anymore. We hope to see her back soon and wish her the best of luck. We do, however, have a new member to the team. His name is Travis Garrett and we will have some work from him up as soon as possible. We've added more designs to Ray's portfolio as well as Quintin's and Eric's. 10/07/09 We've begun rennovation on the new shop! Aren't you excited? We will continue to be open at the Hackley Ave. location until the new building is finished. We'll have updates on the progress as time goes by. We would like to thank all of our wonderful customers for making this possible. We've added more pictures to Quintin's , Liz's and Ray's portfolios. 08/05/09 Quintin Smith is back in town and back to work at his favorite profession. You can look at his portfolio here. We are also now open Mon-Fri 10:00 am til whenever we shut the front lights off and Saturday by appointment. We will be running a tattoo competition during Bikes on the Grand on August 15th at Conestoga Campground. 06/04/09 Added a bunch of new pics to the portfolio for Ray (including some artwork out of the skin) , a couple new pics in Eric's portfolio, and finally added a bio and portfolio for Liz Lunsford, you can check her out here. 04/13/09 Our new artist Liz Lunsford is raring to go and tattooing up a storm. Stop on in and check out her work. We'll have a portfolio and bio built for her shortly. 03/27/09 Well, we might just make the news a bi-annual thing, hehehe. We've recently gotten in our new shirts, shot glasses, tall glasses, and are adding on another artist. We'll get pics and more info up soon, no really, it will happen before 2010. 8/10/08 So yeah, this hasn't been updated in quite some time and there has been a lot missed, sorry about that. We've been really busy and I just plain forgot to do it. Here is a look at the commercial that came out a few months ago. 12/04/07 For the month of December Ray will be running a half off sale on all religious tattoos for whatever holiday you are celebrating, be it Winter Solsticetmas, Chanukah, Arafat Day followed by Eid-al-Adha, Dongzhi, orQuanza. We are currently down to one tattooist so if you come in for one of these designs during December the price will be honored in January if we are too booked up. 10/24/07 We will be closed on Halloween so that we can enjoy our favorite holiday of the year. Trick or Treat and Happy Halloween! Also for the month of November Ray will be running half off on all Native American and Old World tattoos in celebration of Thanksgiving. 10/06/07 We're finally online and ready to go! For the month of October Ray Reasoner is running a half off on all darkside styled tattoos in celebration of Halloween. Email him here or call for a consultation.